You'll have no trouble finding your most important meal of the day during your vacation rental experience. With hundreds of breakfast restaurants to choose from, you and your group are sure to find exactly what you're looking for in A.M. fare. In North Myrtle Beach, there are many independent breakfast spots, so skip the chain, and check one of these out! If your perfect breakfast includes bagels, sandwiches, and pastries, then Krave Bagel and Bistro is the place for you! Made fresh every morning, Krave offers up 17 different options for their delicious bagels. From Butter and Jelly to Bacon Horseradish Cream Cheese to Lox Spread, they have you covered for a tasty bagel. Krave also features breakfast sandwiches like Egg, Egg & Cheese, or Egg, Cheese, and various breakfast meats such as bacon, sausage, and ham. If a sweet dessert is your pleasure, try their Cinnamon Crumb Coffe Cake or one of their freshly-made muffins. For a quick and light breakfast experience, opt for Krave Bagel and Bistro. This house of pancakes will leave you wanting to return again and again during your North Myrtle Beach vacation rental experience. Not only does Golden Griddle Pancake House serve up an array of pancakes, waffles, and omelets, but they also have Daily Specials that are so generous on your wallet! Omelets include Mushroom and Swiss, Western, Veggie, and more. Their spotlight item in this section is the Golden Griddle Omelet, filled with ham, sausage, mushrooms, green peppers, onions, and cheese. Of course, you may have chosen Gold Griddle for its specialty item, pancakes, and there's no shortage of variation in this section. Featuring Blueberry, Georgia Pecan, Strawberry, Peach, Chocolate Chip, and more, there is truly a pancake for everyone! If you're more of a waffle fan, then try any of their Belgian Waffles, featuring topping choices like whipped cream and fresh fruit. Make sure you ask about the daily special for an exceedingly great deal! The Shack is a well-known local eatery that's famous for its delicious Southern flavors. Their breakfast menu builds onto this theme, with traditional Southern morning items like grits and biscuits and gravy. Furthermore, The Shack serves conventional breakfast favorites like eggs, pancakes, home fries, bacon, and sausage. If you're looking for something a little different, make a selection from their multitude of homemade biscuits. Choices include Steak Biscuit, Chicken Biscuit, Sausage, Egg, and Cheese, Country Ham, and more! If you prefer a sandwich over a biscuit, choose from Fried Bologna, Egg, and Cheese; Bacon, Lettuce, and Tomato; and many other tasty options. You're sure to appreciate being in the South when you visit The Shack! 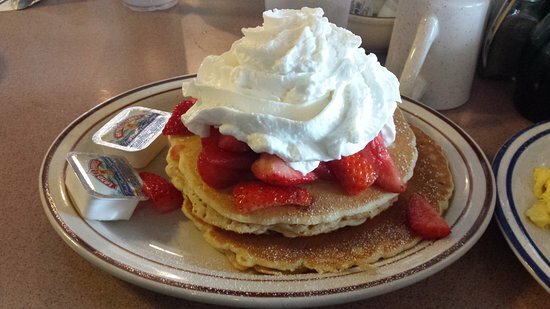 For an extensive menu featuring pretty much everything you could ever want for breakfast, visit Dino's House of Pancakes in North Myrtle Beach. A local favorite for decades, Dino's is well-known for great customer service and delicious morning meals. First, let's focus on the shining star of the menu: Dino's Pancakes! The flapjacks here include Old-Fashioned Buttermilk, Chocolate Chip, and Blueberry on the conventional side, and also include a wider range of specialty pancakes like Hawaiian Pancakes topped with Pineapple and Coconut, Apple-Cinnamon Pancakes, Banana Nut Pancakes, and much more. Kids and adults alike will love the Pigs in a Blanket, featuring 3 sausage links wrapped in 3 glorious Buttermilk Pancakes. In addition to pancakes, Dino's offers up other sweet breakfast treats like Waffles and French Toast. The restaurant serves savory items like breakfast sandwiches and other specials, including Eggs Florentine, Steak and Eggs, Crab Cake Benedict, and more. With additional hot bread and pastry items, as well as fresh fruit selections, the menu never seems to end at Dino's House of Pancakes! For an experience that is a little bit different, try the Sunday Gospel Brunch at the House of Blues in North Myrtle Beach. This buffet-style brunch is served while visitors enjoy the soulful sounds of traditional and contemporary gospel music. Groove to the beat, while you dine on traditional breakfast items like bacon, mini waffles with syrup, scrambled eggs, assorted muffins, fresh fruit, biscuits with country gravy, and made-to-order omelets. Lunch and more savory items may include roasted garlic potatoes, peel and eat boiled shrimp, macaroni and cheese, jambalaya, baked or fried chicken, and more! There's plenty to satisfy everyone in your group when you visit the Sunday Gospel Brunch at the House of Blues. Why go to the same chain restaurants you have back home? When you're on a trip to North Myrtle Beach, make your vacation experience more memorable with a visit to one of these local independent establishments. Make your most important meal of the day your best meal of the day too!